Normandy Life: Mosaic Monday # 38 - Lisboa/Lisbon, Portugal. Mosaic Monday # 38 - Lisboa/Lisbon, Portugal. As you probably know by now the SP and I do love to travel. Some of our happiest memories are of sun kissed beaches in Greece, European city breaks and time spent enjoying bijou B&B's in the US and France. When we're not travelling ourselves we enjoy watching travel programmes on TV, especially if the presenter is a chef. We often discover a new place to add to our travel wish list and sometimes rediscover somewhere we have visited previously, as recently happened when we watched Chef Rick Stein spend a long weekend in Lisbon, Portugal. 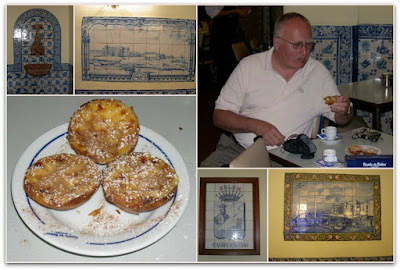 In the summer of 2008 after 10 days spent relaxing in Praia d'el Rey on Portugal's Silver Coast we drove to the Hotel Dona Maria I, Pousada Palacio de Queluz which we had chosen as our base for exploring Lisbon and the surrounding area. 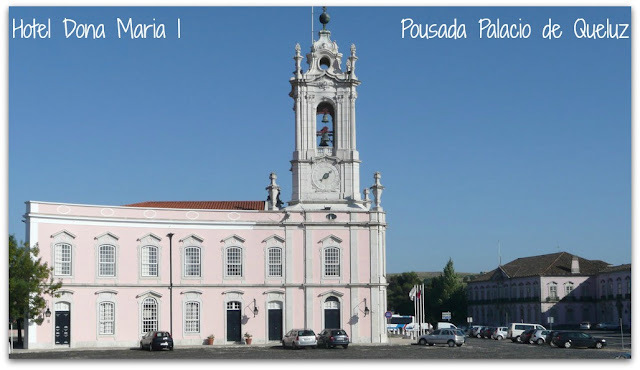 The Hotel Dona Maria I is situated across the square from the Palace in a building which once served as the Guardhouse. In order to make the most of our 4 days there we hired a driver to take us around and show us the sights. 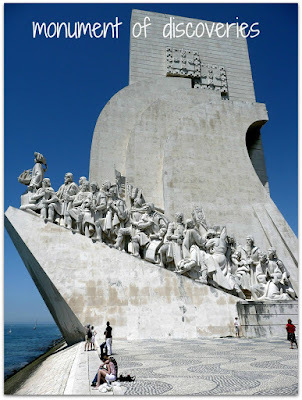 Whilst this was an extremely good way to discover Lisbon for the first time the days were very full and quite tiring. 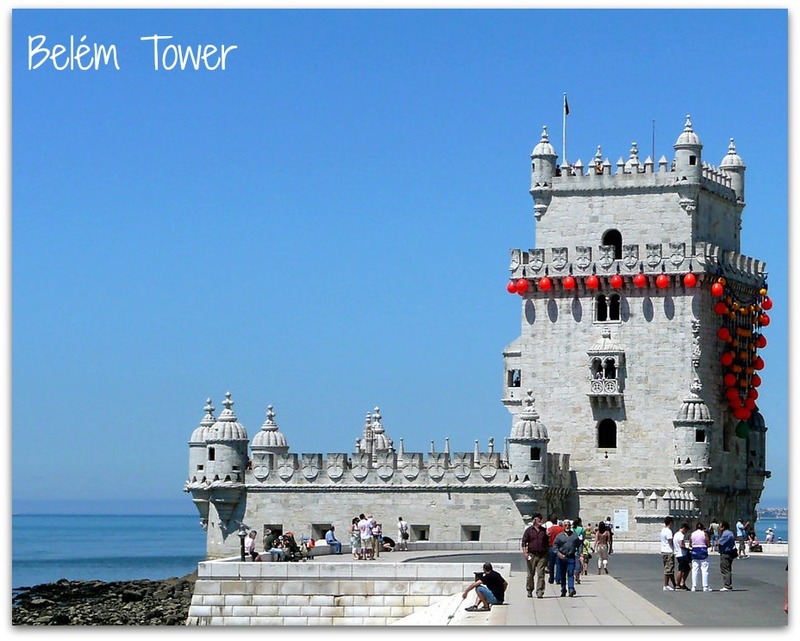 Here are some things you might like to know about Lisbon. 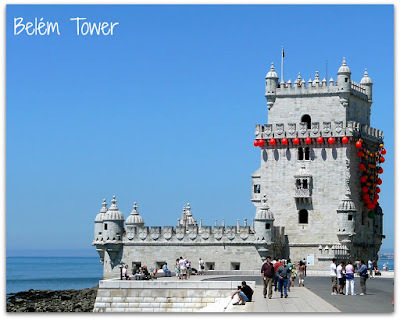 Belém is a district of Lisbon that you must visit, here you'll find fascinating museums, the famous Belém Tower and the Monument of Discoveries. The Monument of Discoveries on the bank of the River Tagus, celebrates the Age of Discoveries in the 15th and 16th centuries. The first Monument was a wooden structure created in 1940 for the World's Fair. It was replaced in 1960 by the 52 metre tall concrete monument which now dominates the shoreline. 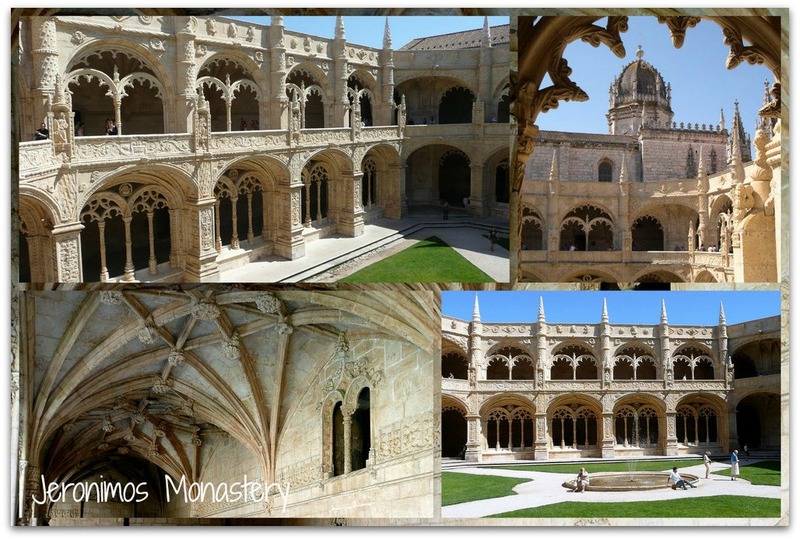 Jeronimos Monastery owes it's existence to the wealth and prosperity brought to Lisbon through trade with Portuguese colonies founded by early explorers such as Vasco de Gama. 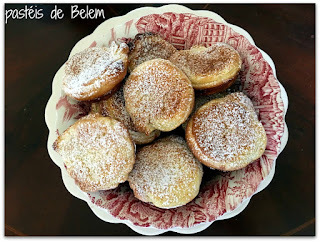 The Catholic monks who lived in the Monastery were also responsible for creating the famous sweet custard tarts known as Pastéis de Belém. the SP enjoying his first taste of Pastéis de Belém. Our guide introduced us to these delicious tarts at the famous bakery next door to the Monastery, click here to learn the history of how it all began in 1837. Watching Rick Stein strolling through downtown Lisbon inspired us to start planning a more leisurely return trip maybe later this year and prompted me to bake some Pastéis de Belem which turned out quite well for a first attempt. Pastéis de Belém, home made by me. We also enjoyed seeing the National Coach Museum in the Old Royal Riding School and the Maritime Museum, click here for a complete up to date guide to visiting Lisbon. Pat has asked for the recipe for the pasteis, the one I used was from olive magazine, you'll find it on my Pinterest board "Bake", or follow the link here. Happy May Day morning Maggie. Lisbon would be a great city to visit, hope some day... I have read Night train to Lisbon by Pascal Mercier - a great book. You are very fortunate to be able to travel so frequently, Maggie! I hope to visit Spain and Portugal one day and Lisbon is definitely a city I'd like to see. Your custard tarts look so delicious! You will have to share the recipe with us one day soon. Happy Month of May! I got the recipe from olive magazine and pinned it to my Pinterest board "Bake". A great place to visit indeed. Your photographs are amazing. 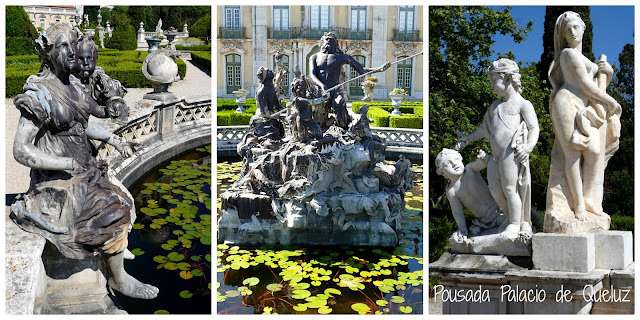 Like Pat I've never been to Portugal, but I think I have to, it preserves so much ancient history and such beautiful palaces, thank you for sharing your gorgeous photos with us, darling Maggie ! You're good travelers! I enjoyed your interesting post! A beautiful city ... and I can only imagine that your return trip will be even more fun, now that you're familiar with it. Those pastries look delicious. Thank you for hosting as always. Happy May! The Monument of Discoveries is truly amazing. I'm sure you could look at it and see all kinds of details. What a fabulous work of art! And thanks for the recipe! Happy MM! Hugs! This looks like a great place to re-visit leisurely. The monument really is amazing. How nice that you and your husband can enjoy these travels and good eats together. Those pastries look delicious. Thank you for hosting Mosaic Monday and I hope you have a good first week of May! Good morning, Maggie! I had no idea that I wanted to visit Lisbon until I read this blog post. I would especially be interested in the monastery. Your photos really drew me in! thank you for hosting MM. I hope you have a good week. We loved visiting Lisbon, Maggie. So much to see and do there, and we met some lovely people in Alfama. I know virtually nothing about Portugal and found this a most interesting post, Maggie. Another place to add to my list of places to visit. We recently watched Night Train to Lisbon which also added to my miniscule knowledge of the country. Thanks for posting the link to the pastries, and for hosting MM. It's a highlight of the week for me. There are so many wonderful and historic places to visit in Europe. It's no wonder you both love to travel. Such a beautiful place to travel and to see so many aspects. A historical place and lots of info about the things you enjoyed so much. Those pastries must be so delicious! :) Thankful for sharing them with all of us! A gorgeous month of Spring in May! That's some impressive sculpture and architecture! Thank you for the recipe, it looks outstanding. Off to look it up. Have a good week, Maggie. Thank you Maggie for sharing Lisbon today. Thank you too for your 38th Mosaic Monday, always a pleasure to visit and join in.